Here we are, another year, another Halloween. Ghost and ghoulies and skeletons and witches and food....because to me the best part of any Holiday is the yumminess that ensues. I don't do too many things on Halloween, but this year I'll actually be making some fun things for the kids, and mainly because they're getting older and won't be as into Trick or Treating as before. 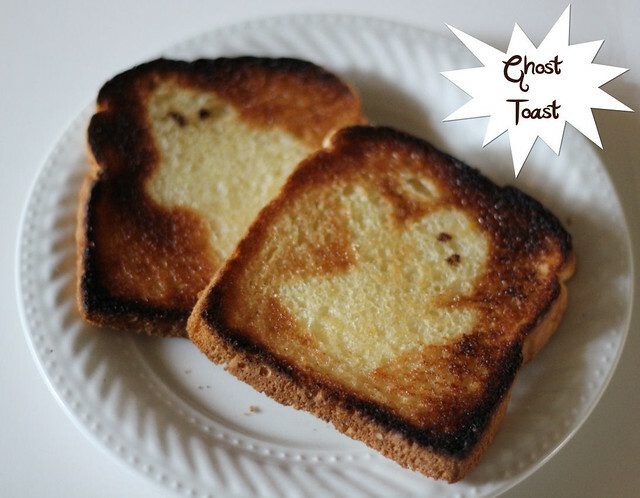 To start off the day, some Ghost Toast. Super easy to make. Using this technique you can most certainly make this toast for any other Holiday during the year and use either shapes or words etc. 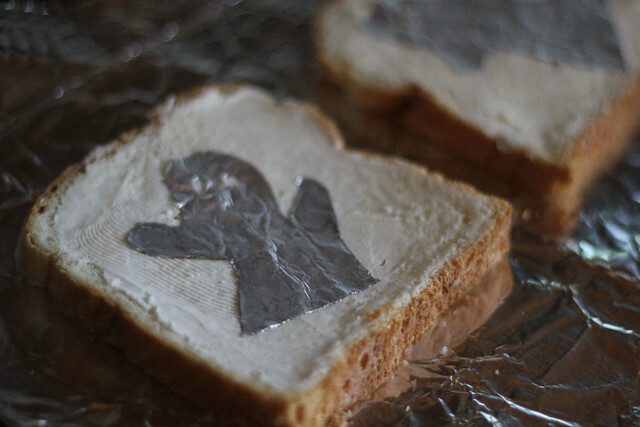 Cut or tear some foil into a ghost shape. I prefer cutting though foil is not exactly the easiest to cut, it has this tendency to wrinkle and tear. But best as you can, just cut out your shape. Remember to make some eyes. I use my metal kitchen thermometer to gently poke out some eyes and I just bend the foil backwards. Now sprinkle a good amount of cinnamon sugar. 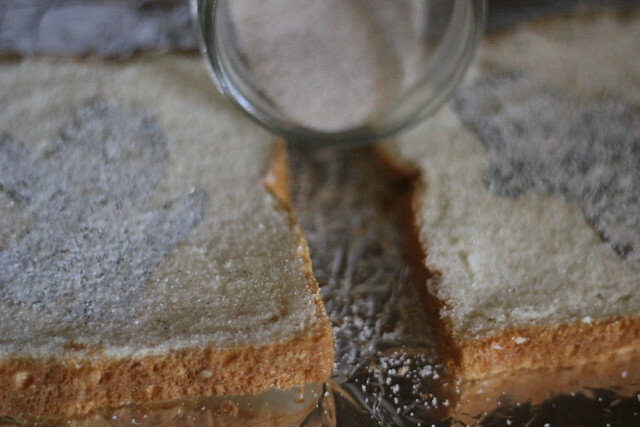 Take your cinnamon and give a good sprinkle over the eyes. 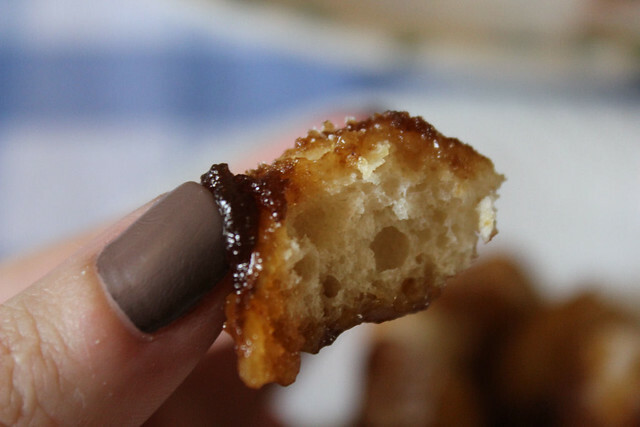 I take my finger and just push the cinnamon into the eye holes. (you can do this part in the end too if you prefer). Broil it for about 2 or 3 minutes until it's to your liking. Remove the foil and serve. 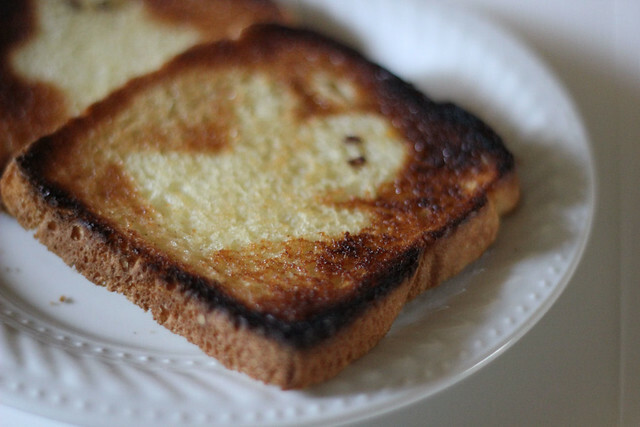 My kids LOVE this toast, they always find it amazing that the shape is in the bread. Last payday when I did my grocery shopping, I looked around, I used coupons, I took advantage of "buy one, get one free" etc. I ended up getting groceries for the whole month, for a family of 4, for just $400. I'm thrilled because usually my food budget is around $220 dollars for 2 weeks, which is not really bad considering the price of things, but I've been wanting to cut back for a while. So here is my Menu Plan for the next two weeks....and again you may wonder why it starts halfway through the week, and the reason for that is that we're military and get paid twice a month, which is when I do my grocery shopping, so my week of menus starts on whichever day payday falls on. I've been making these for my family for as long as I can remember. Sometimes I add a layer of whipped topping as well, other times I omit it, it depends on the occasion. 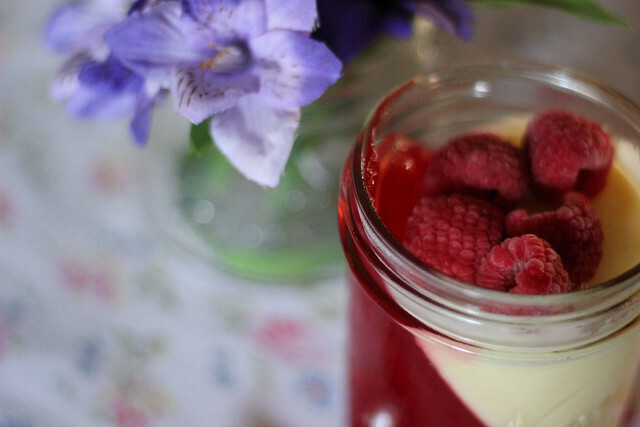 Yesterday, rather, last night....I went into the kitchen to make some in jars and when I poured the jello using the speed set method, one of the jars fell to the side at an angle. It was teetering on the lid and I thought, now wouldn't it be cool if it set like that???? And there came the idea. Make the jello according to box directions, pour into jars about halfway up. Close tightly with lid, then set them in the refrigerator at an angle. You can prop them on whatever is in there that will keep them at a 45 degree angle. Let it set. 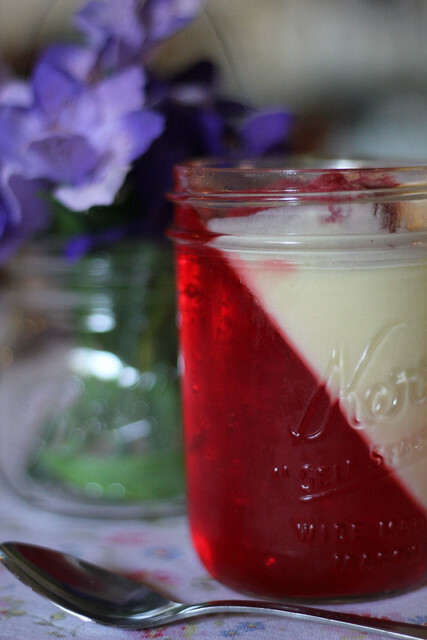 When jello is done, make the pudding following the directions. Again I used the speed method to set faster. 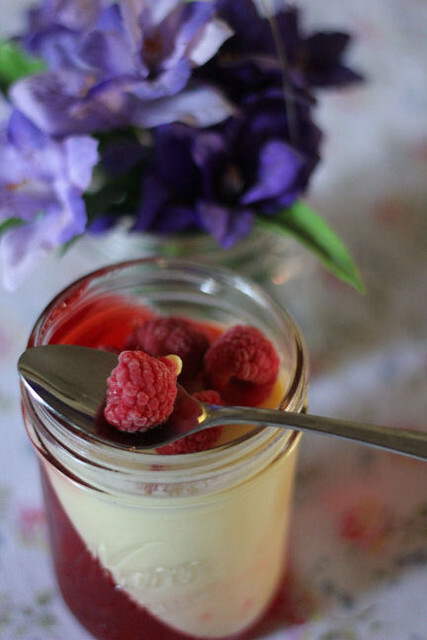 Remove the jars from the fridge, and slowly and carefully pour the pudding into the jars. Close tightly and place back in the fridge to set. I topped these with frozen raspberries, but next time I'm going to use granola, different berries, maybe a layer of whipped topping. Christmas time I think I'll do 3 layers horizontally, using red jello, vanilla pudding and a layer of green jello. How fun! I think the thing I most love about cooking, is the ability to put together a meal from scratch without following a recipe, and have it turn out well. 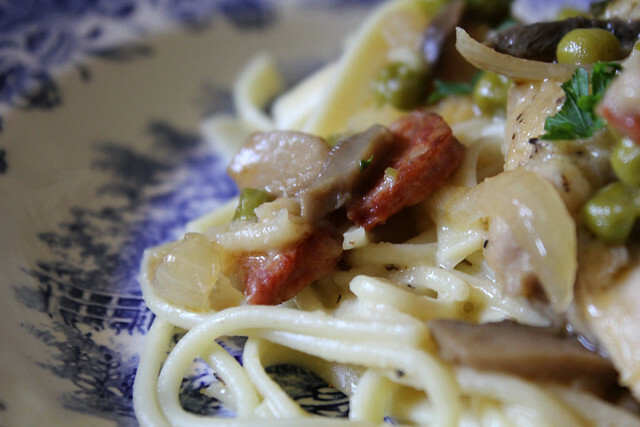 Knowing that your family loves the food you prepare for them, is a feeling like no other. 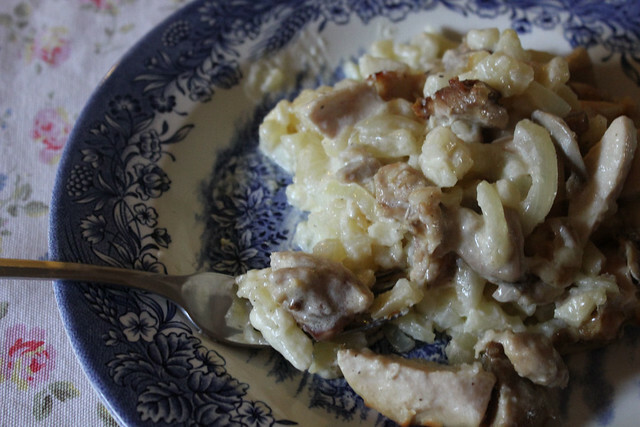 This dish came about because I've been cooking Portuguese food these past two weeks, and actually had some random pieces of chicken in the freezer. There were 4 thighs and 3 tenders that I wanted to cook up before going bad, and I knew that I wanted a casserole kind of meal. 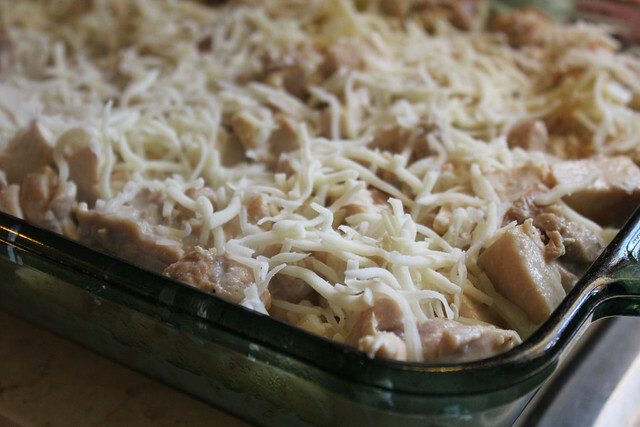 So, a bit of this and a little of that and out came this comforting casserole. In a big skillet, add a little bit of olive oil, the onion and the garlic. Cook over medium heat until the onion is tender. Add the chicken and cook until done. Add the chicken broth and the can of mushrooms and simmer for about 5 minutes. You'll notice that most if not all of the liquid has evaporated. Season with salt to taste. Next goes in the heavy cream. I didn't measure, I just added as much as I wanted. I think it was about 2 cups. Stir until well combined. In a 13 x 9 inch pan, spray with a little nonstick spray. Add in the bag of potatoes and even them out. Pour the chicken mixture over the potatoes. At this point you can add a little more heavy cream if you wish, I drizzled a little more over the top just to be sure the potatoes had enough liquid to cook in. Sprinkle on a little shredded mozzarella cheese, then cover with foil and bake in a 425 degree oven for about 30 minutes. Check if the potatoes are done, if they are, remove the foil and bake for a further 5 minutes or so to brown. 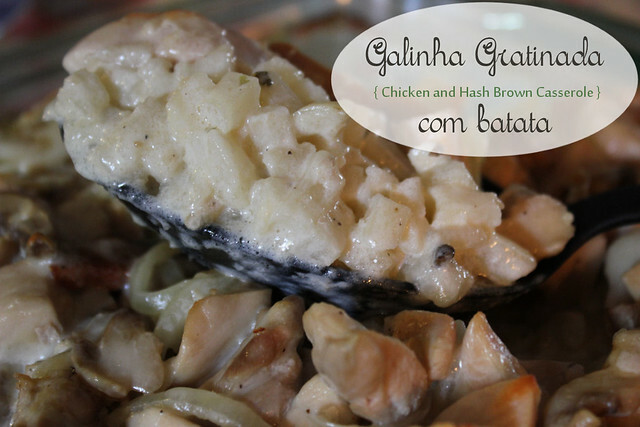 Another simple but delicious Portuguese recipe. 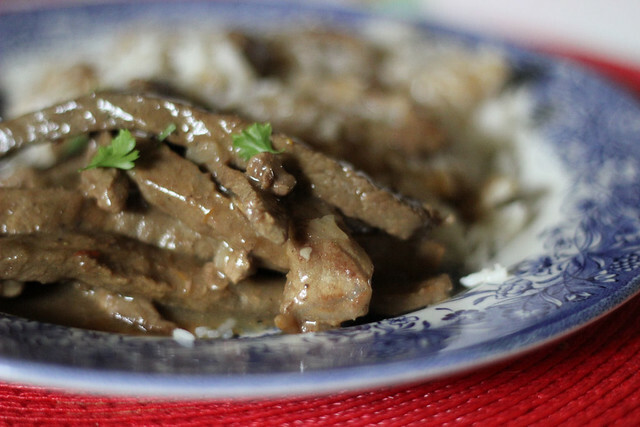 The key word here is simple because with the addition of a mushroom and onion soup mix, you create a gorgeous looking meal with a thick gravy that is perfect for drizzling over rice or mashed potatoes. 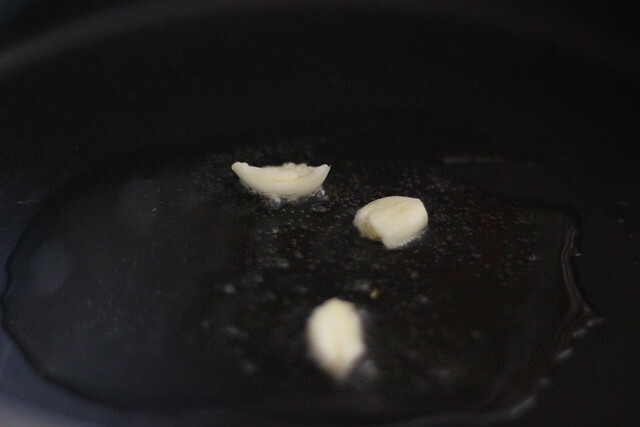 In a big skillet, add a bit of olive oil, about 2 tablespoons, and fry the garlic for a minute or two, don't let it burn. Add the steak strips and cook until brown and done. 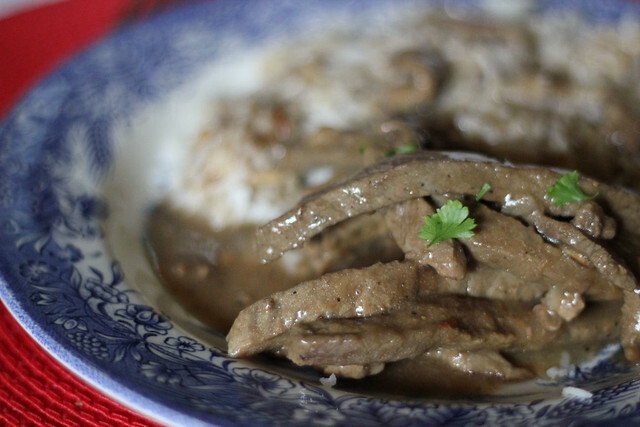 Add in the packet of mushroom and onion gravy. 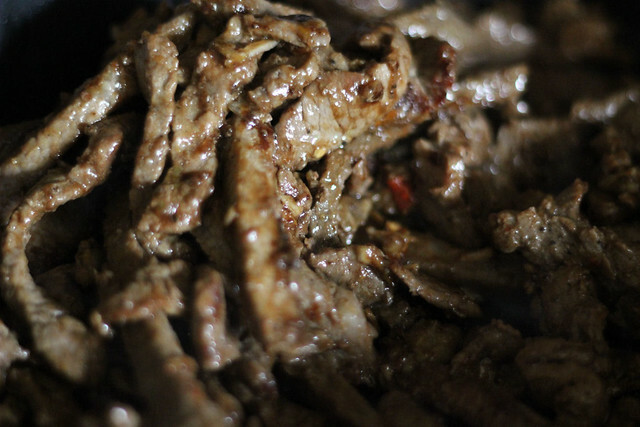 Sprinkle on the flour and give it a good stir so all the meat is covered. Then pour in the water, stir well and cook for a few minutes until the sauce thickens. You can sprinkle on some fresh cut parsley if you wish. Serve immediately. 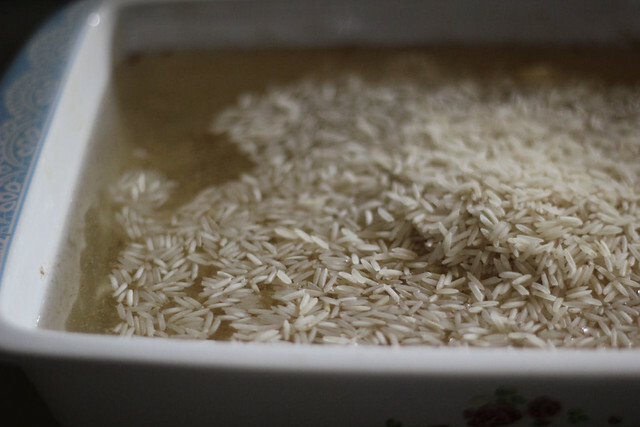 One of my favorite ways to make rice, especially when in big quantities. I also like the fact that I can pop in a chicken or roast in the oven and put the rice right along with it, have everything cook together. 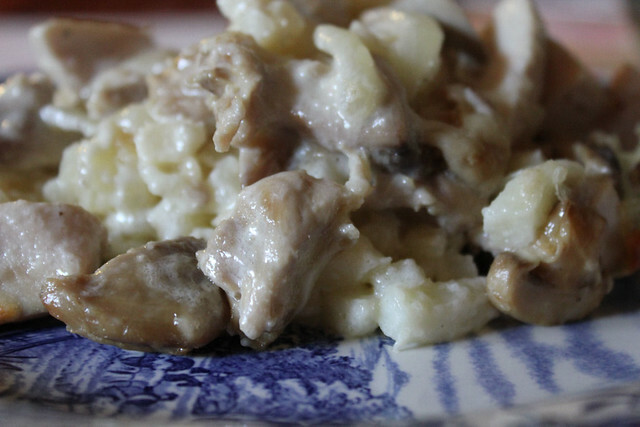 This is a pretty common Portuguese recipe and the best part is that you can use beef or chicken or even vegetable stock. 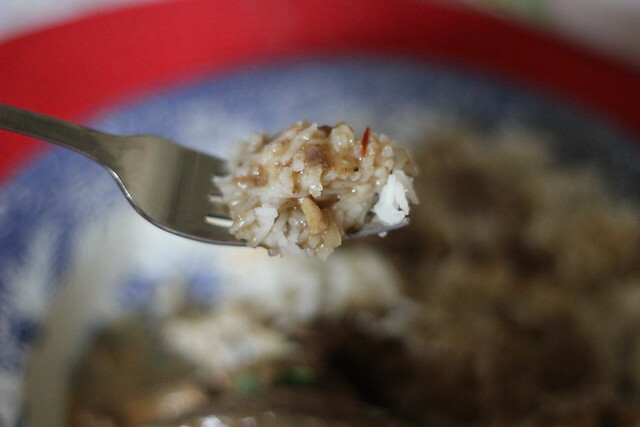 In an oven proof dish, add the water, the rice, the bouillon cube crumbled, the garlic and some salt, give it a good stir. Bake at 375 degrees until done. Now, sometimes it takes 45 minutes for me, other times it takes an hour, there is no set time for this, just keep an eye on it and remove it when it's cooked to your liking. What I like the most is that it creates this crust along the sides, it's nice and crispy. Yum! 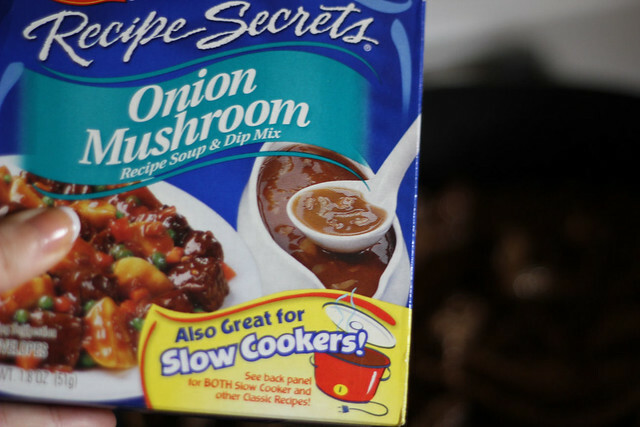 I have been working with Musselman's for a long time, and they are by far some of my favorite products and staples on my pantry shelf. 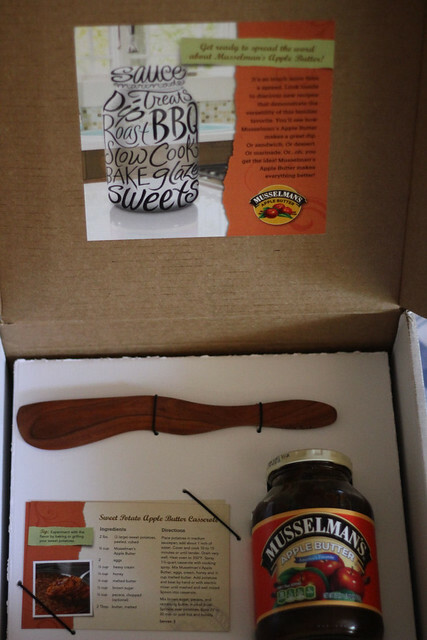 I was sent this cute kit with Apple Butter, 3 yummy recipes to try and a handcrafted wooden Spurtle. 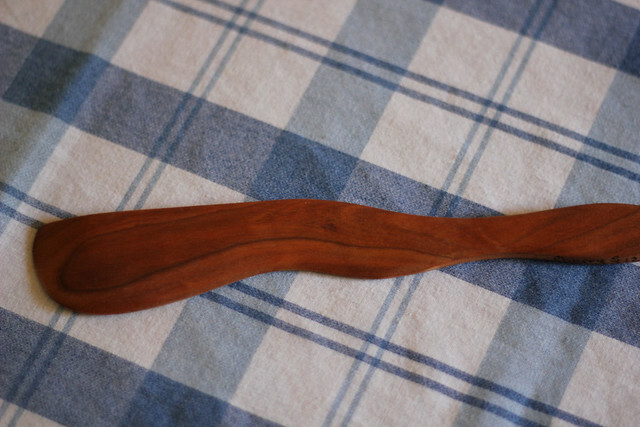 What is a Spurtle you may ask? Well I had that question too and I can say that I did not have one of these in my kitchen, but oh I was missing out on something so cool. I think with Fall here, aside from pumpkin, one of the things that most signifies cooler temps and Fall is Apple Butter. For me, that is. And I've always preferred Musselman's Apple Butter. So I was sent 3 recipes that sound really good. 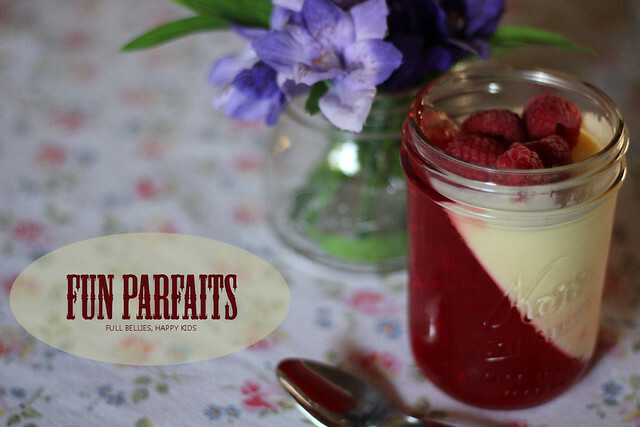 One of them we won't be trying and that is simply because as you've heard me say many times before, I just don't like mixing fruity stuff with main dishes, it's just a personal preference. But for those who do like it, check out the Apple Butter Marinade for Chicken. Now onto the other 2 recipes. One is already safely stashed away for Thanksgiving, because it sounds SO good and I can't wait to try it. I'm talking about Sweet Potato Apple Butter Casserole. The third recipe, I decided I just had to try right away. 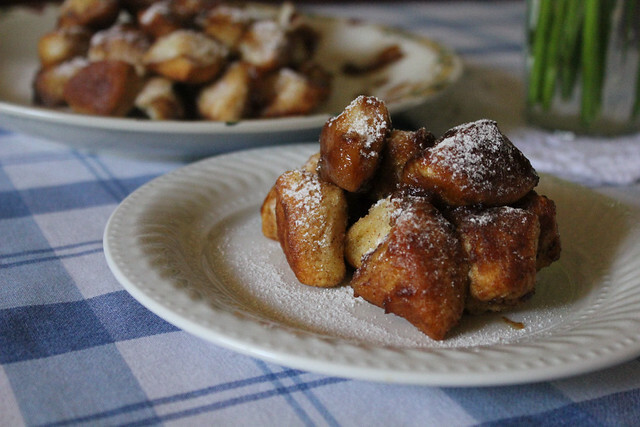 We love monkey bread, I make it many times but I had never tried it with Apple Butter. Oh boy, salivating here. 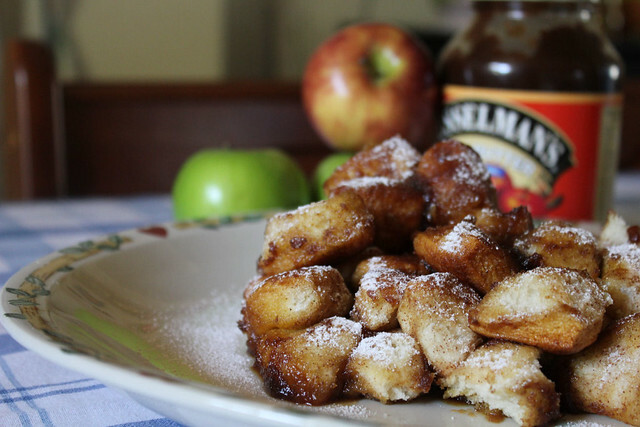 You have GOT to make this for Fall, it is so delicious, I can't believe I never thought to use Musselman's Apple Butter in it before. Separate biscuits and cut in quarters. 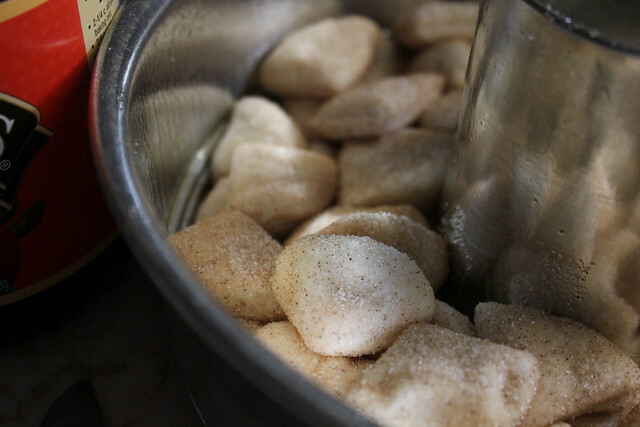 In a bowl, combine sugar and cinnamon. 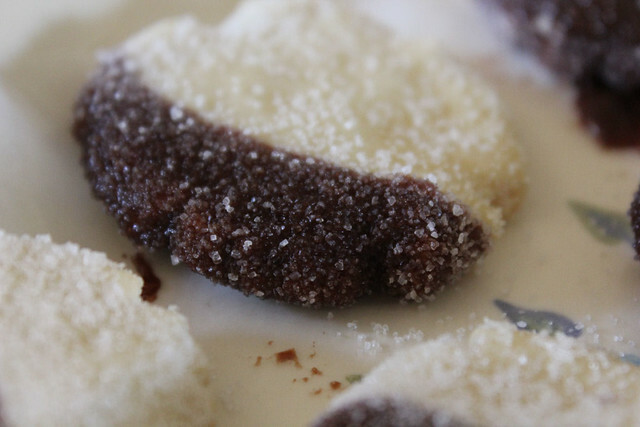 Roll biscuit pieces in cinnamon sugar to coat, and drop them in a greased Bundt pan. Make sure they are distributed evenly. 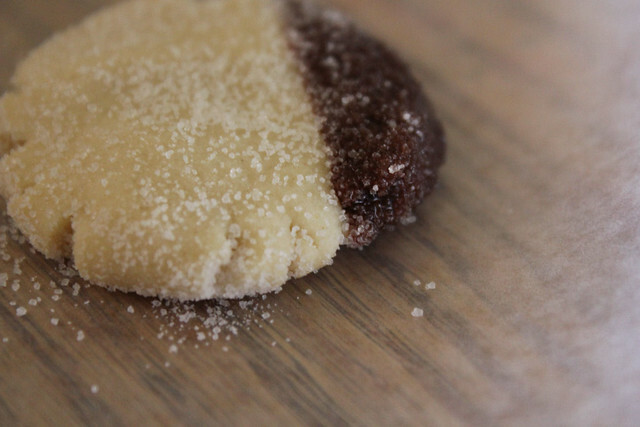 On the stove top, heat the butter, brown sugar and sugar to a boil until sugar is dissolved. Remove from heat and stir in apple butter. 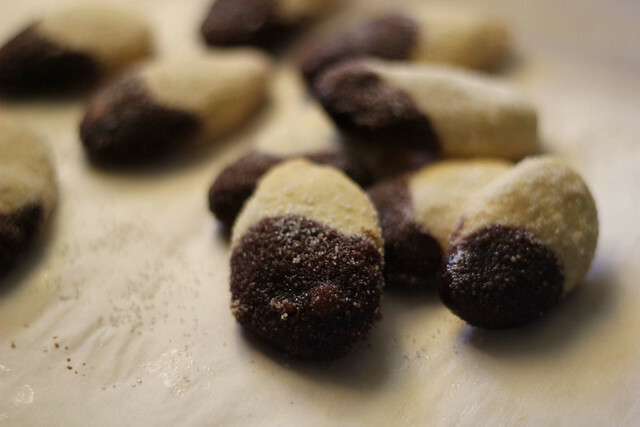 Pour mixture over the dough, and bake in a pre-heated 350°F oven for 30 minutes. Let stand 10 minutes, turn upside down onto serving plate, and remove pan. 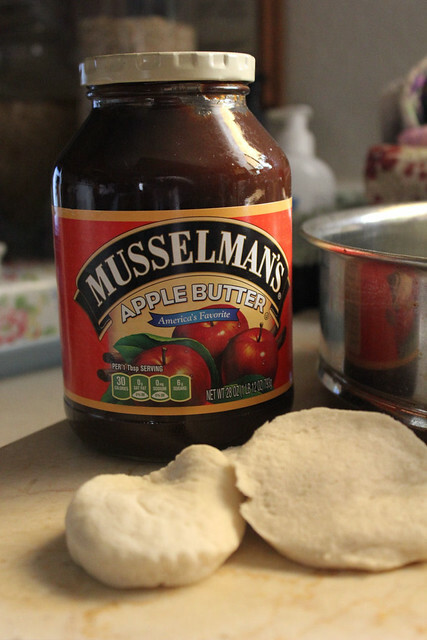 Musselman's Apple Butter is non-dairy and can be found in the jam/jelly aisle of your grocery store. 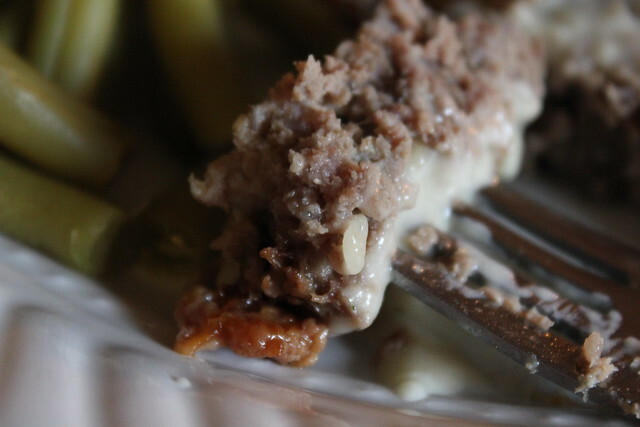 For more recipes, you can go to the Musselman's website. Thank you to Musselman's for providing me with a sample at no cost. 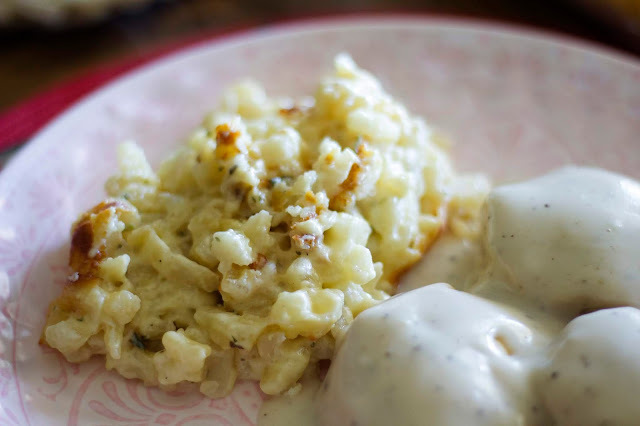 This is such a basic recipe, with only a few ingredients, but it tastes good, it's filling, it's comforting and it's perfect for cold weather. 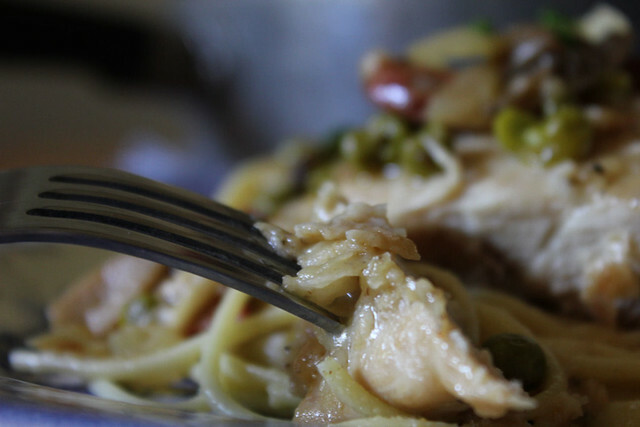 Not to mention that it's a pretty inexpensive meal for your family and for us, a family of four, it makes quite a lot, enough that I always have more than enough to freeze for another meal. You can eat it just as is, or you can make it even more filling and stretch it even further, by serving it with some rice, which is what I do. 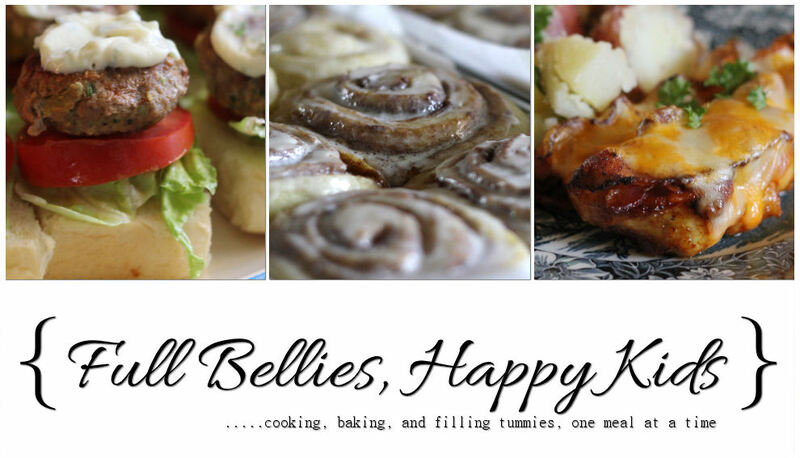 Been making this one for so many years, but especially when we're trying to cut back on the food budget. I don't soak my beans overnight. I've done it with other recipes but for this one, since it's cooking all day, I really don't need to do it. Wash the beans really well, then place them in your crockpot. Add in the water. If you're using bacon or ham hock, add them in now. If you're using diced or sliced ham, wait until about an hour before it's done to add it in. Season with salt and pepper, garlic powder and the onion flakes. Cook on LOW for 8 hours or on HIGH for 4 hours. 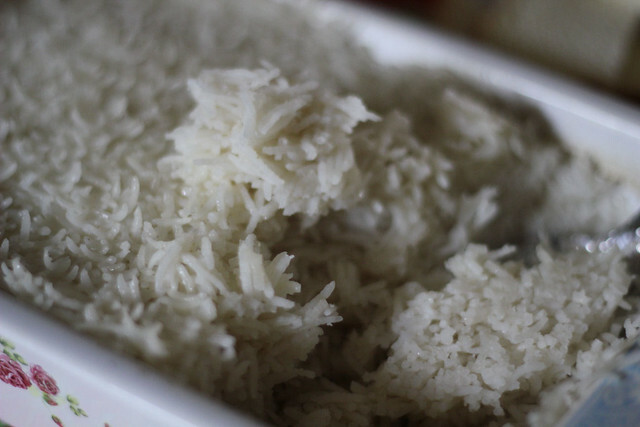 Serve as is, or over rice. 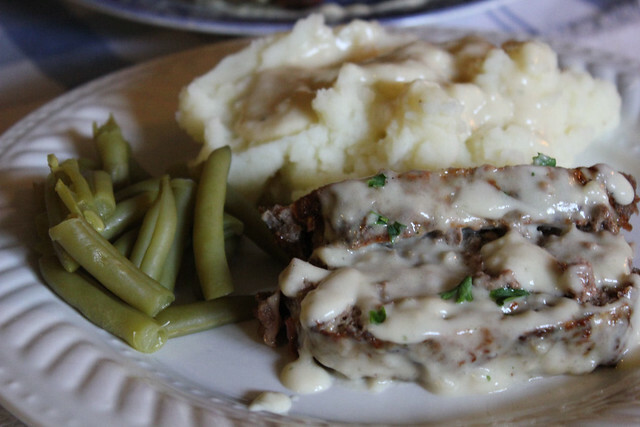 Loved this meatloaf, it got the big thumbs up from the whole family. Whisk egg and cream together in small bowl. Stir in bread and set aside to soak. 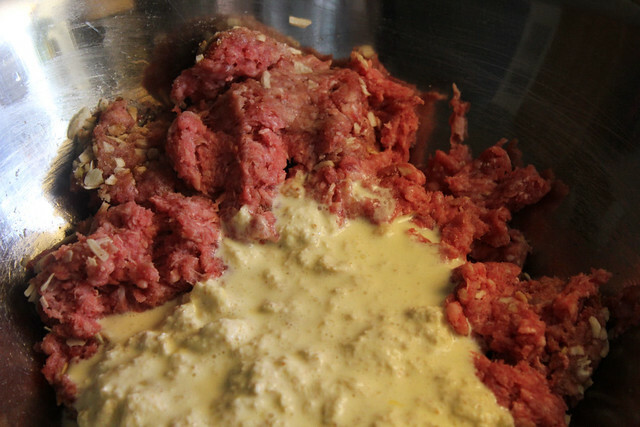 Blend hamburger & pork, onion, nutmeg, allspice, pepper, brown sugar, and salt smooth and uniform. Using fork, mash bread mixture until no large dry bread chunks remain. Add mixture to beef mixture and blend until well mixed. During the last 10-15 minutes prepare the sauce. Melt butter, add flour and cook, stirring constantly with whisk, until flour is light brown. Add brown sugar and bring to simmer. Reduce heat to medium and cook until sauce is reduced to about 1 cup, about 5 minutes. Stir in cream and return to simmer. 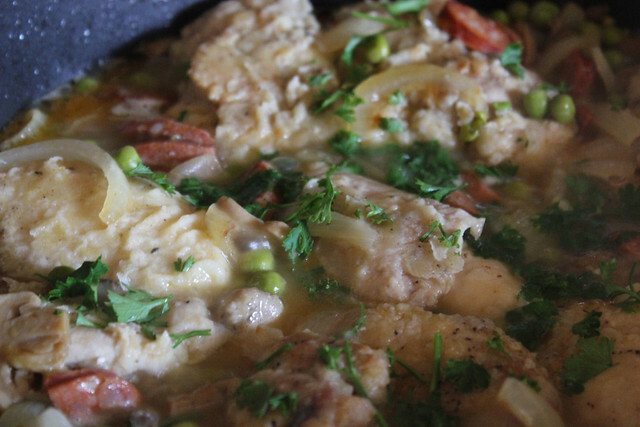 Every time I make a Portuguese dish, I feel like I'm going home. 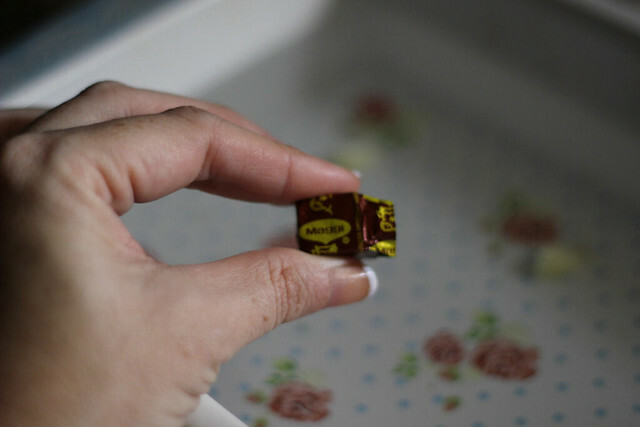 One smell, one taste and I am back in my childhood in the kitchen, watching my Greatgrandma cooking, asking her questions about the food about the utensils, how you do this and that. Hearing the TV in the other room, my brothers voices laughing and talking animatedly. But the aroma, that is the biggest thing for me, it's unmistakable. Funny how certain things are like trigger objects for our mind. 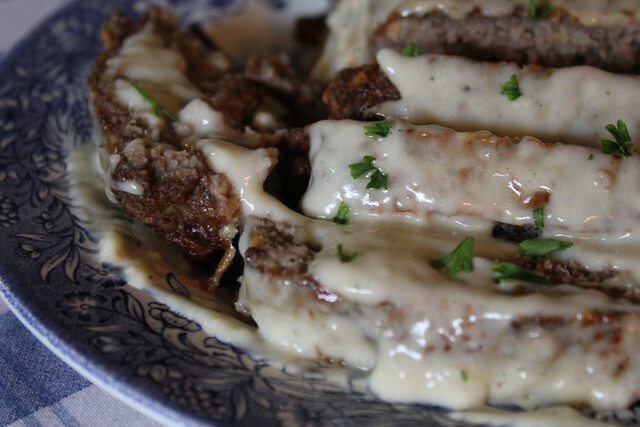 Next two weeks of menus will be mainly Portuguese food, except for one or two dishes that I had already planned on making, like tonight's Swedish Meatloaf, and tomorrow's Slow Cooker White beans and ham. 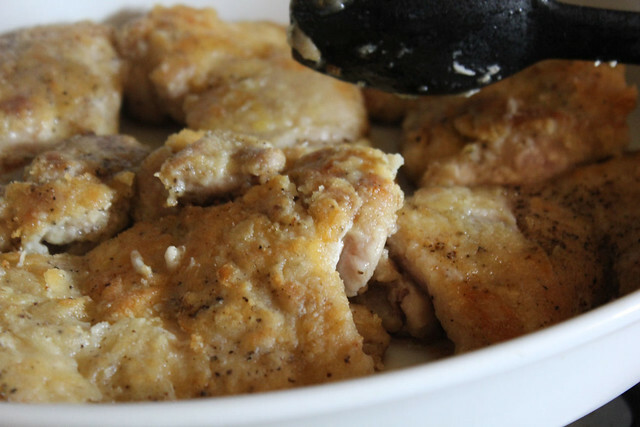 Start by seasoning the chicken thighs with salt and pepper, then coat it with flour. 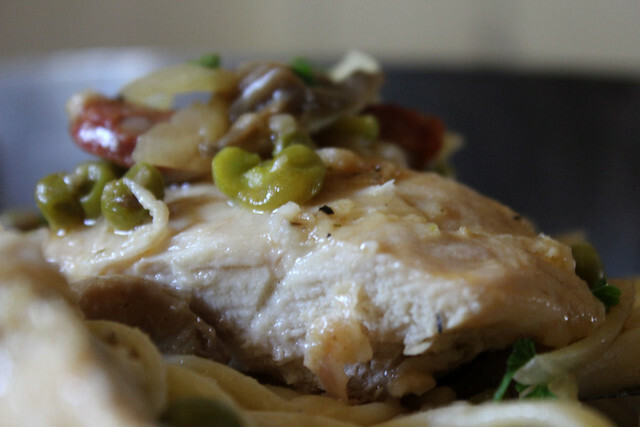 In a big skillet, add about a tablespoon of olive oil then brown the chicken on both sides. Remove from skillet and keep warm. 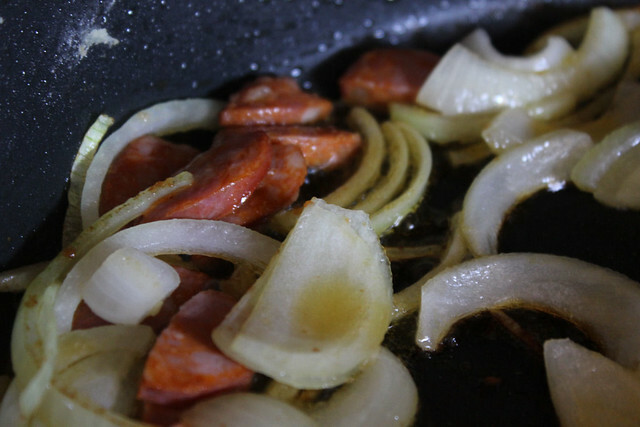 Add the onion and linguica to the skillet and cook until onion is tender. Next goes in about a teaspoon and a half of chicken bouillon granules, about a cup of water and a smidge of vinegar, just drizzle a little in there, you don't want a lot. 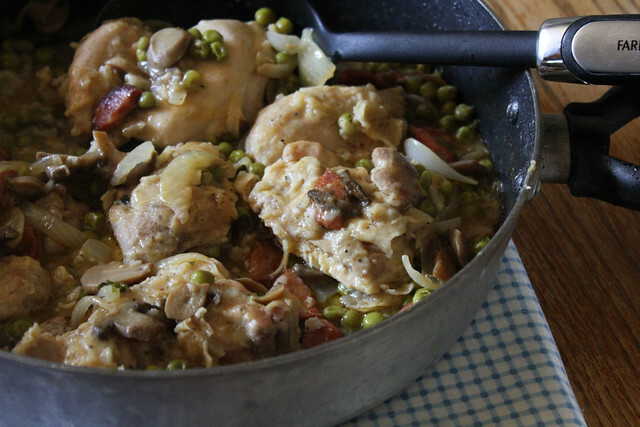 Give it a good stir and then add in the peas and the mushrooms. Put the chicken back in the skillet, sprinkle on chopped fresh parsley, and simmer for about 25 minutes until chicken is cooked completely. Make sure to keep checking on it and stirring, and keeping adding a little bit of water so it doesn't stick, you also want some gravy. 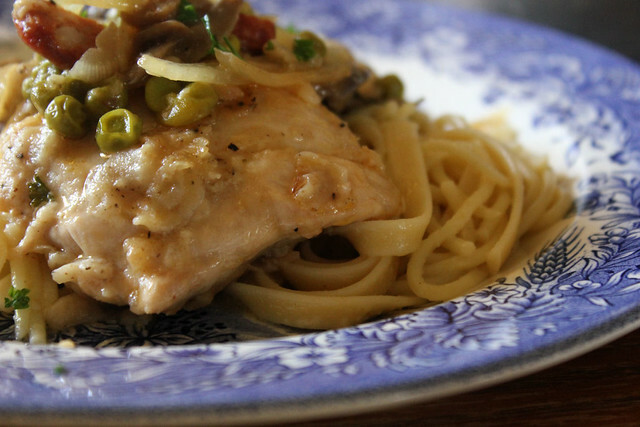 Serve with some buttered spaghetti, or rice, or potatoes. I know I'm awful at writing recipes because I don't follow directions or measurements, I cook from the heart and I learned to eyeball everything. So if something doesn't make sense or doesn't seem right, please let me know. My youngest asked me to make cookies yesterday. Seeing as I don't have any chocolate chips in the pantry, I turned to my go to recipe which is quick and yummy. You can certainly eat these alone without dipping them or rolling them in sugar, but the cookie dough does not have any sugar so you may not enjoy it. I just mix all three ingredients in my Kitchen-Aid until the dough is malleable and able to form into little balls. 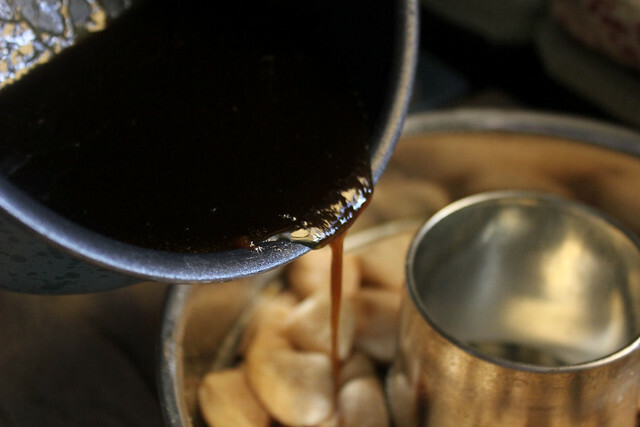 Form the dough into small balls and then flatten them slightly and place on an ungreased cookie sheet. Bake at 375 degrees for about 20 minutes. They will be ready when you shake the pan and they come loose. In a bowl, combine the chocolate and the water, mix well. 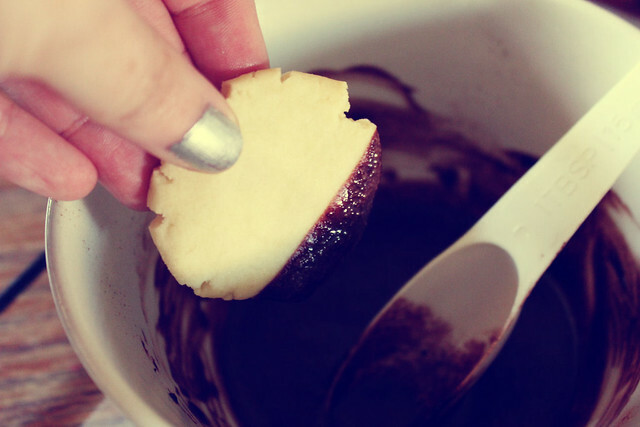 Then take the cookies and dip them halfway into the chocolate mixture, then roll them in sugar. I like to place mine in the refrigerator to harden a little, then again living in Arizona, it is imperative that I keep any kind of chocolate stuff in the fridge. 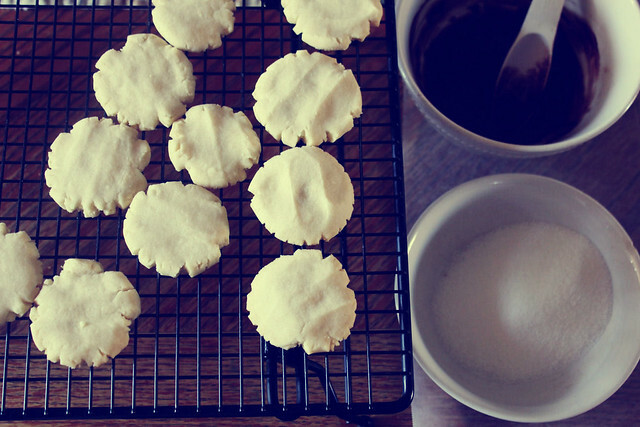 Note: I shaped some into ovals, you can shape them however you want, you can even use a cookie press if you wish.